It's no secret - we love Downers Grove. From the charming streets, to the tight knit communities and the vibrant downtown, we're never surprised when a client wants to dig deeper roots in this town. 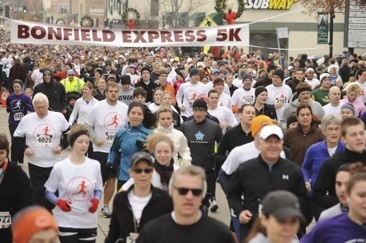 The annual Bonfield Express 5K Thanksgiving Day race is one of the many events that makes this community so special. Runners, walkers, kids in strollers and even dogs come out in droves despite cold November temps. There's a fantastic energy in the air (not to mention the fun of neighbors along the race course that pass out donut holes and pump out fun music!) that kicks of Thanksgiving in such a wonderful way. Oakley Home Builders is a proud sponsor of this race and happy to support this organization that finds such meaningful ways to help local schools and students. Since 2004, the Bonfield Express Foundation has given over $400,000 in scholarships to 182 seniors at six local high schools in Downers, Westmont, Lisle and Hinsdale. The organization also recently donated $1,000 to each of the District 58 schools. The western suburbs have so many fantastic towns that do so much to foster their individual communities. It is one of the things that pulls our clients to choose to build new construction homes in towns like Western Springs, Hinsdale, Clarendon Hills, Downers Grove, Naperville, Glen Ellyn and Elmhurst. So we're curious - What are the events that you feel make your town so special? Be sure to let us know in the comments below!